Posted March 26, 2019 by Melrose Dental Arts & filed under Patient Education, Preventive Dentistry. It’s easy for visits to the dentist to become just a checklist item. It’s something you do every six months (hopefully) without really thinking about it. If this is your approach to visiting the dentist, you may actually be receiving inferior care! It’s reasonable to want to get a lot out of your biannual checkups. Quality dental care starts with information and education. Not only should your dental practice be providing you with good treatment, but the staff should help you understand your own oral health. When you’re an informed patient, you can better care for your teeth at home. The entire point of preventive dentistry checkups is to reduce your risk for cavities and gum disease. To do this, you need to be able to adequately care for your teeth at home. Your dentist is your teammate in making that happen. During your checkup, you should feel encouraged to ask questions about your own oral health and how to care for your teeth. Your dentist should ensure that you know how to brush your teeth properly, and that you’re using the right kind of brush, floss, and toothpaste at home. Everyone needs to evaluate their home care routine from time-to-time, and your dentist should help. The most memorable part of any biannual dentist visit is probably going to be the cleaning you receive. A professional cleaning serves multiple purposes. Principally, a professional cleaning removes bacteria and plaque buildup from your teeth to prevent cavities. Even if you brush your teeth and floss regularly at home, there are still probably going to be places that you miss. This is a secondary aspect of your cleaning: Your hygienist should notice the areas of your teeth with more buildup and direct you to those areas to help you focus your home cleaning routine. After your cleaning, your dentist will pay you a visit, examine your teeth, and refer to any x-rays you may have received. 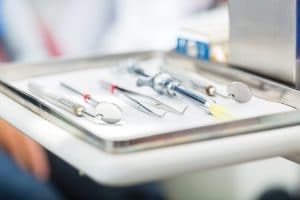 This examination may feel like a sort of sign off on the care you’ve already received, but it also gives your dentist the opportunity to make any recommendations or offer additional treatment. Perhaps fluoride treatment would help fortify weakened enamel. Dental sealants can help younger patients prevent cavities on difficult-to-reach teeth. This part of your visit should feel collaborative and conversational. You shouldn’t leave dental appointments with more questions than answers. If your biannual visits don’t leave you feeling good about the state of your teeth, it’s time to find a dentist that cares! Dr. Amiri and the Melrose Dental Arts team provide quality care centered around patient education. Make an appointment for your next checkup by contacting Melrose Dental Arts in Vista, CA at 760-724-9117.